The Litigation Skills program invites students to engage in rigorous, hands-on training providing them with the practical skills necessary for competent professional legal service. Taught by a faculty of experienced trial lawyers and judges, almost 75 percent of second and third year law students enroll in this six-credit course. Although the number of courtroom trials may be less, Litigation departments at major law firms, government agencies, prosecution and defender offices and legal service organizations continue to staff and hire at record numbers. 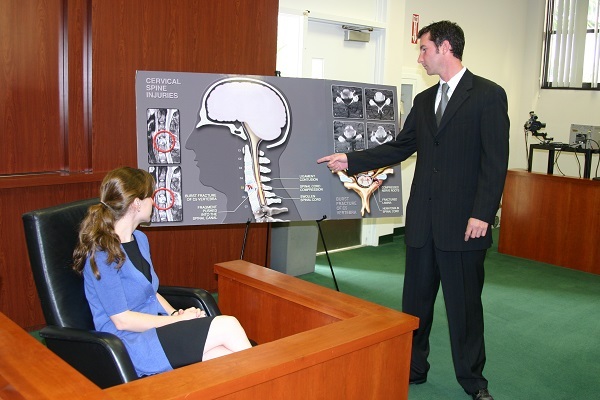 The Litigation Skills Program develops critical thinking and decision-making skills. These advocacy skills benefit students who decide to pursue litigation and also those who choose other career paths such as transactions, presentations to decision-making bodies (i.e. zoning boards, legislative committees) potential voters, and many other audiences. How is Miami Law’s Litigation Skills Unique from Other Law School Programs? Comprehensive, NOT Condensed Training: Other law schools typically only teach the trial advocacy portion as an intensive course delivered over a short period of time, but Miami Law’s Litigation Skills Program offers a comprehensive, SEMESTER-LONG litigation skills course open to all students who wish to participate and it includes BOTH pretrial skills and trial skills. Coordinated Curriculum: A number of law schools teach trial advocacy by the use of adjunct faculty who develop their individual course. Some law schools teach pretrial advocacy, also usually using adjuncts who teach their individual syllabus. Litigation Skills is unique among law schools in that the program teaches both trial and pretrial advocacy in a coordinated approach, utilizing adjunct faculty who teach from an established curricula, and is coordinated by full-time faculty members, Laurence Rose, and Celeste Higgins. Exhibit foundations are developed along with fact investigation. Experienced and Dedicated Faculty: Full-time faculty members direct the program, and a superb adjunct faculty of more than 65 highly experienced trial attorneys and judges, from both state and federal courts, assist with the lectures, demonstrations, trial and pre-trial courses. Immediate Feedback: The skills learned by each student are reinforced through contemporaneous critique by a number of faculty, including judges, lawyers and theatre/communications teachers. The Litigation Skills I course is comprised of weekly lectures/demonstrations supplemented by pretrial and trial workshops that each meet once a week. Students learn how to litigate a case from start to finish by developing a full range of pretrial practice skills such as: client interviewing, pleading, deposition and discovery, investigation, arguing motions and negotiation. Students also receive instruction in trial advocacy skills including: jury selection, opening statements, direct and cross examination, objections, exhibits, trial technology and closing argument. The course culminates in a highly anticipated Final Trial where students bring together the skills they have acquired throughout the semester and conduct a full mock trial before real jurors. Students receive candid critique and feedback from the both the faculty and guest judges. Litigation Skills I is open to all second and third year law students who have successfully completed Evidence. Honors grades are determined based on student participation and performance in classroom simulations, as well as performance in a mid-semester bench trial and the final trial. Students who do particularly well are given awards and scholarships. The Litigation Skills department has a separate registration process which is done internally and completed earlier than regular law course registration. Students interested in taking Litigation Skills should visit the Lit Skills Course Registration in Courses & Registration area of the web. Students have the option to take either Advanced Business Litigation Skills II or Advanced Criminal Litigation Skills II. All courses are taught by leading trial lawyers and judges. Litigation Skills II is open to students who have successfully completed Litigation Skills I.
Additionally, Miami Law's students who complete Litigation Skills I can be placed in our six-credit externship program in which they are certified by the Supreme Court of Florida (or other jursidictions) to engage in the supervised practice of law. Miami Law's Litigation Skills Externship Program provides students with the opportunity to apply the trial and pre-trial skills learned during the Litigation Skills I semester in a live client setting. Students may represent clients in criminal and civil matters and argue cases in Circuit, County and Federal courts or other tribunals under the supervision of practicing attorneys. Externs are placed locally, nationally and internationally. Successful completion of Litigation Skills I is a prerequisite for the Externship. Students will also become Certified Legal Interns by the by the Supreme Court of Florida or other jurisdictions. Obtaining a Florida Clearance to work as a Florida Certified Legal Intern takes approximately 120 days to complete. This is NOT the same as the Florida Supreme Court (or other state supreme court) background clearance. Students can elect to participate in a future externship program in advance, when they register for Litigation Skills I or can enroll during regular registration. All externships receive six-credits and require completion of at least 220 hours of service. Students also attend a weekly Clinical Placement and Theory Seminar providing training in advanced skills and professional responsibility. While externships are available during the regular semester after Litigation Skills I, many students choose to do a summer placement. Students who are placed outside of the Miami area enroll in an online weekly seminar. The Litigation Skills Program Faculty is comprised of experienced law firm partners, trial lawyers, federal and state judges, prosecutors, and public defenders who work closely with student presentations in simulated courtroom and law office situations. To register and participate as a juror the Litigation Skills final trials, click here.